Shah Rukh Khan’s daughter Suhana Khan has grown up to become a beautiful young lady. We're currently gushing about Suhana's transformation from a shy girl into a diva in the making. The pretty star-kid is basking in the limelight already. She never shies away from the shutterbugs and is a true trendsetter in every sense of the word. It didn't take us long to figure out that her beautiful brown eyes, long luscious tresses and strong posing game aren't the only eye-catching qualities. She's a true fashion girl! SRK and family are currently vacationing in Europe. In fact, their pictures are giving us major travel goals! Doting daddy put up a picture with his darling daughter Suhana as his Instagram story and made our hearts melt and mommy Gauri too took to her feed to share a picture of her kids enjoying with their cousins. And now, hold your breath! 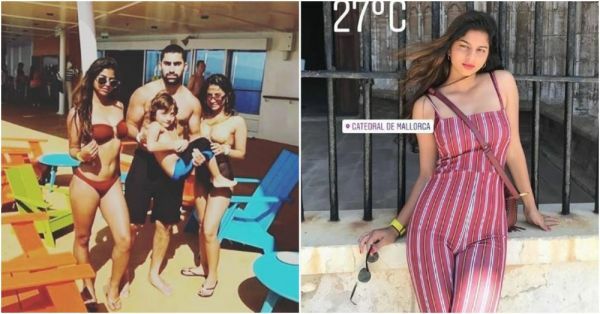 Two pictures of Suhana from the vacation were recently spotted online and have left us swooning. In one, she sports a brown bikini and looks drop dead gorgeous. She's seen posing with Robin Passi, AbRam, and her cousin Alia Chhiba. We're especially loving how confident and happy she looks! Another picture that's doing the rounds on the internet is one of her clad in a red and white striped jumpsuit. 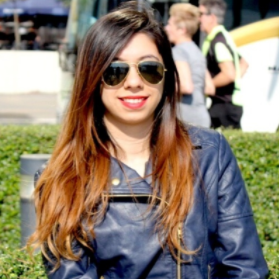 With a matching bag, subtle lipstick and tousled hair, Suhana looks gorgeous AF!